AN EVENT in eastern Europe last weekend was dedicated to a Dumfriesshire missionary who gave her life to help protect Jewish schoolgirls in World War Two. 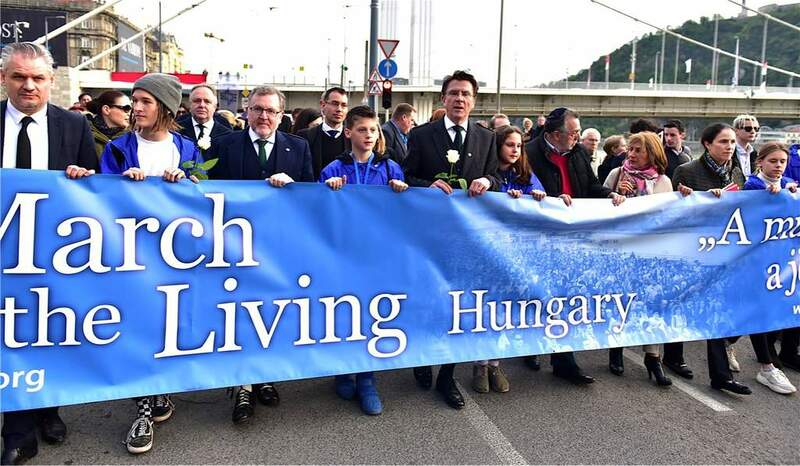 The annual ‘March of the Living’ in Budapest on Sunday evening commemorated the life of Jane Haining, a native of Dunscore, near Dumfries, who died in Auschwitz-Birkenau extermination camp in 1944, aged 47. Scottish Secretary David Mundell was a speaker and guest of honour as was fellow Scot Iain Lindsay, British Ambassador to Hungary. Both were invited to join the front row of the lengthy procession of more than 10,000 people, some carrying torches, who walked through streets in the Hungarian capital. The Dumfriesshire Clydesdale and Tweeddale MP, who also lit a beacon next to the River Danube at the conclusion of the march, expressed pride that Jane Haining was deservedly being commemorated in such a way during the 75th anniversary year since her death. It was close to The Shoes on the Dunube Memorial, a thought-provoking tribute to those, mostly jews, shot by fascists on the river bank during World War Two before plunging into the waters and being washed away. Before execution, victims were ordered to remove their clothing with shoes being kept because of their value. An inspirational former Dumfries Academy pupil, Jane left the UK in 1932 to work in the Church of Scotland’s mission school in Budapest, later becoming matron of a hostel mainly caring for Jewish pupils, some orphaned from refugee families. After the German invasion of Hungary, she was arrested by the Gestapo and sent to the horrific concentration camp where she died two months later. In his speech, Mr Mundell referred to research in a recent book which revealed Jane may have also saved many Jews from the Holocaust by helping them emigrate from Hungary to the UK. He said: “For her pupils, many of who were orphaned Jewish girls, she embodied the values of fairness, tolerance and equality. “And it was these values which saw her steadfastly refuse to abandon these children during the Second World War. “Following the German occupation of Hungary, with her safety under great threat, her dedication to them was without limit. The Scottish Secretary referred to Ben Helfgott, a concentration camp survivor, who was instrumental in gaining recognition for Jane. While in Budapest, the Scottish Secretary also visited the Dohany Street Synagogue, the largest in Europe, St Columba’s Church of Scotland and the Holocaust Memorial Centre. Last Friday, Mr Mundell and his son, Dumfriesshire MSP Oliver Mundell, both visited the heritage centre at Dunscore Church, which features Jane Haining’s life story and welcomes visitors from around the world. The MP distributed leaflets about Dunscore and the heritage centre during his visit the Budapest.